Export A-Frame From Unity Scene. Clone This Repository in your PC. Open this Repository as Project from Unity3D. Double click sample to open sample Scene. 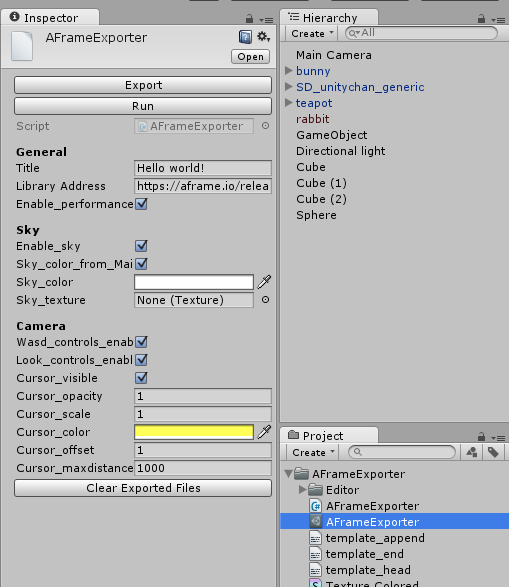 Click AFrameExporter prefab to show exporter inspector. Click Export button on inspector. 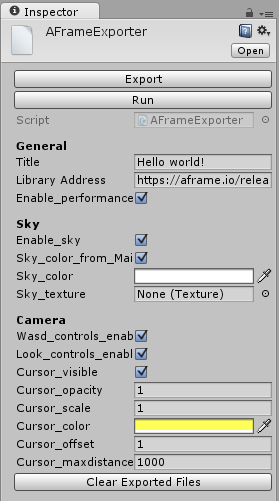 Export Scene as A-Frame in created export folder. Click Run button to show created A-Frame on browser. 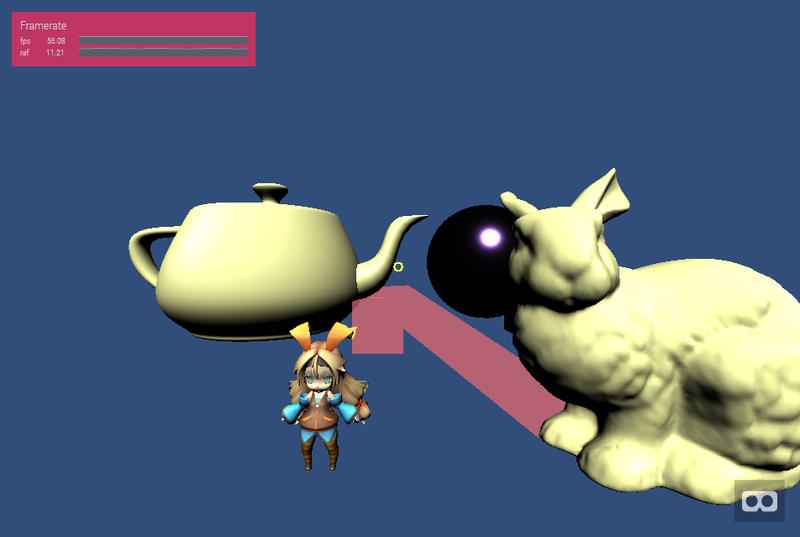 Import to your Unity3D Project. Open your project from Unity3D. Open scene you want to export. A-Frame library address you want to use. Use sky color from Main Camera Background. Change cursor opacity.0 to 1. If you editted export folder. These file will be deleted. ・You can’t use Asset from Unity Asset Store limited of EULA. But, you can ask asset developer about it. ・If you editted index.html in export folder, and re-export , It will be deleted. Before edit A-Frame, please copy export folder to another directory. ・Export only main texture from object. 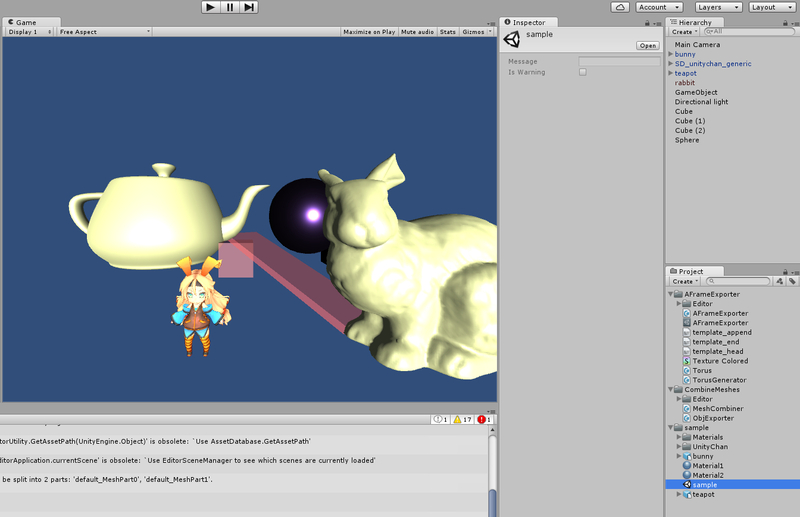 Supported parameters are Position, Rotation, Fov, NearClip, FarClip. Supported parameters are Position, Rotaion, Intensity, Color. Supported parameters are Scale xyz. Scale parameters are exported average xyz. because A-Frame Sphere have parameter only radius. Scale y export as height. Scale xz are exported average for A-Frame cylinder radius.